It's known among veg-heads as PSB, and it's the new darling of chefs looking for unusual vegetables to tempt their customers. 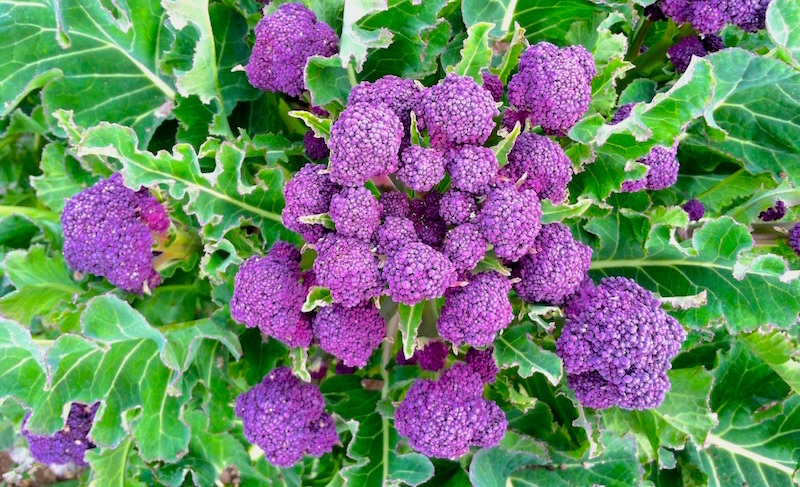 Purple sprouting broccoli, which is planted in midsummer and must overwinter prior to harvest in early spring, is also getting noticed by farmers who want to expand their roster of early season produce during the time of year known as the "hunger gap"—between the end of storage crops like squash and root vegetables and the appearance of early spring vegetables. 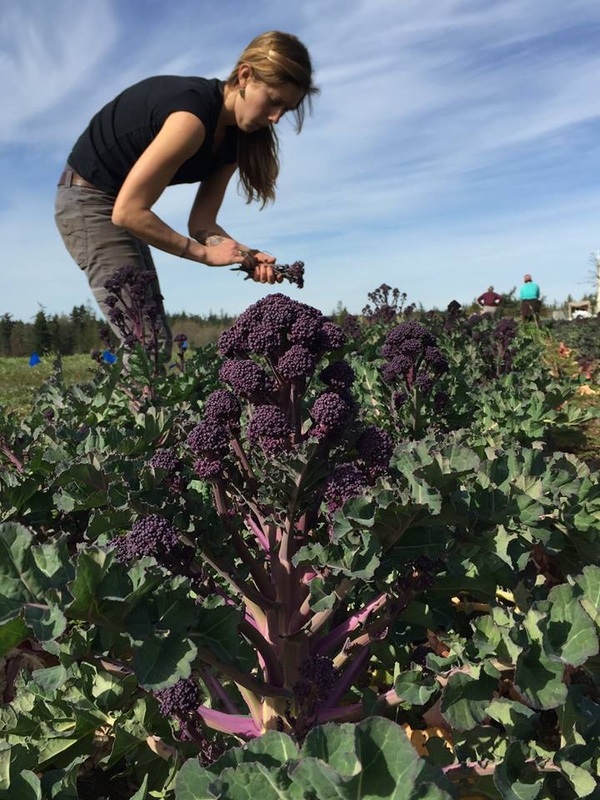 A field trial of purple sprouting broccoli. 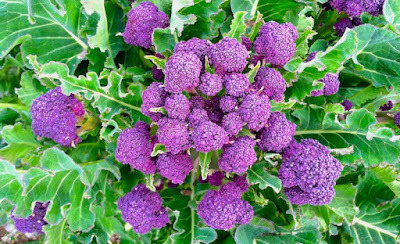 It came about because the Organic Seed Alliance (OSA) wanted to develop an organic variety of purple sprouting broccoli and partnered with the Organically Grown Company, one of the Northwest's largest organic produce distributors. Over two years, the OSA tested nine varieties of the new broccoli on sites in Oregon and Washington—called "breeding trials" in ag-speak—and held taste tests with farmers, retailers and chefs before choosing the winner to be distributed to seed companies. In an article in the OSA's spring newsletter, writer Margarett Waterbury writes that "its deep, saturated purple coloration—which signals the presence of antioxidant-rich anthocyanins—feels almost as nourishing to the eyes as the body. 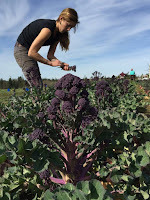 A study at the Liverpool John Moores University School of Pharmacy and Biomolecular Sciences found that raw purple sprouting broccoli has an antioxidant content nearly 38% greater than raw green broccoli." In her article, Waterbury included a recipe from one of my favorite chefs, Tim Wastell of Sweedeedee, for a roasted broccoli and radish dish that was rated as swoon-worthy by my testers here at home. The dressing is worth making a double batch, since it'd also make a great dip for raw vegetables, where the broccoli would particularly shine—unfortunately, like the purple variety of string beans, it turns green when cooked. Make the cashew miso paste by combining the cashews and miso paste. Work with a mortar and pestle until smooth or simply put ingredients in a blender and blend on medium. Add the maple syrup, rice vinegar and juice of half of the lime and continue to mix until homogenous. Thin out a bit with cold water if necessary; the texture should be akin to that of tahini paste. Set aside or store in refrigerator for up to a week. Wash, dry and trim the PSB into long skinny pieces, leaving florets as intact as possible; transfer to mixing bowl. Wash and dry the radishes if necessary. Cut 3/4 of them through the stem into quarters, leaving the best-looking leaves as attached as possible and add to the mixing bowl. Thinly slice the remaining radishes on a mandolin and set aside in a small container of ice water. Set oven to high broil setting. Dress the PSB and quartered radishes with the cashew miso paste and arrange on a parchment-lined, oven-safe tray. Broil until lightly charred, about three or four minutes. Transfer to a serving dish, arrange sliced radishes on top and finish with flake salt and juice of the remaining half lime. Serves 4. Photos from the Organic Seed Alliance.